Pascal Gadoury presented his thesis seminar to a small but very interested audience. Click on the pics for larger images. Pascal after presenting his very interesting talk. After some coaxing, we manage to convince Dr. Robitaille to let me take his picture. Next week: last seminars of the semester! Coming up next week, we have the last set of seminars for the semester, featuring another double-header of Nick Sirmas and Simon Freijer-Poulsen Cloutier. Simon will be giving a talk on “Condition Monitoring of Rotating Machinery via Harmonic Subset Analysis” and Nick will be giving a talk on “Shock Instability in Gases Characterized by Inelastic Collisions”. The talk abstracts follow below. Place: CBY D103 – NOTE ROOM CHANGE! The analysis of system vibration is a popular industrial method for monitoring the health of rotating machinery, such as shaft bearings and gearboxes. Examining the overall energy of these systems with statistical measures, such as RMS or kurtosis, can be done quickly and has proved a popular solution, with the downside of often being vague in terms of the system’s actual condition. More intensive methods, such as neural networks or PSO, can provide more explicit information, but tend to require extended processing time (restricting real-time usage) and/or reference data from the system in a healthy state (difficult to obtain). Additionally, the physical structure of the system can potentially restrict how sensors can be placed and what kind of data can be collected. An automated, real-time solution is proposed which operates on the premise of Harmonic Subset Analysis, effectively using each individual frequency’s harmonic behaviours to filter the signal spectrum on a point-for-point basis. In this way, the algorithm achieves aggressive de-noising (above 99%) which highlights the regions of strong harmonic relevance denoting rotational events and greatly aids in automated detection. Through model fitting of the filtered spectrum, the system is then capable of rapidly identifying the target machine’s operating speed and any associated faults within range of each sensor. The algorithm’s operational parameters are limited to fixed and known values, such that it can still be used in cases where the shaft speed is not known or where no healthy reference data is available. Its harmonic-based structure also implicitly retains low-amplitude harmonics while filtering out non-harmonic interference. Practical testing, using laboratory data and without any tuning, produced the expected results: The algorithm was able to determine both the system’s shaft speed and fault state within a reasonable margin of error. Computation time in a non-optimised state was roughly five times the source signal’s length, still within the realm of continuous application. The current study addresses the stability of shock waves propagating through dissipative media, analogous to both granular media and molecular gases undergoing endothermic reactions. In order to investigate the stability, a simple molecular dynamics model was developed to observe shock waves and their structures with the inclusion of energy dissipation. For this, an Event Driven Molecular Dynamics model was implemented in a 2D environment, where a molecule is represented by a disk. The simulations addressed the formation of a shock wave in a gas by the sudden acceleration of a piston. Inelastic collisions were assumed to occur only if an impact velocity threshold is surpassed, representing the activation energy of the dissipative reactions. Parametric studies were conducted for this molecular model, by varying the strength of the shock wave, the activation threshold and the degree of inelasticity in the collisions. The resulting simulations showed that a shock structure does indeed become unstable with the presence of dissipative collisions. This instability manifests itself in the form of distinctive high density non-uniformities behind the shock wave, which take the form of convective rolls. The spacing and size of this “nger-like” unstable pattern was shown to be dependent on the degree of inelasticity, the activation energy, and the strength of the driving piston. The mechanism responsible for the instability was addressed by studying the time evolution of the material undergoing the shock wave compression and further relaxation. It is found that the gas develops the instability on the same time scales as the clustering instability in homogeneous gases, rst observed by Goldhirsch and Zanetti in granular gases. This conrmed that the clustering instability is the dominant mechanism. 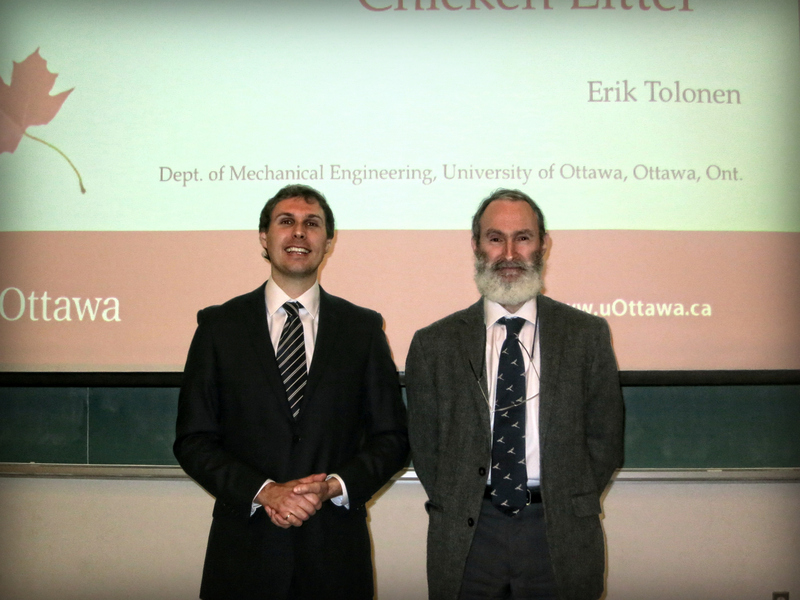 Erik Tolonen presented his thesis seminar this past Friday. The audience was very interested to hear on the results of producing biofuel from chicken litter. A copy of his presentation can be seen here. A few photos of the presented with his supervisor are below. Click on the photos for a larger image. Pascal Gadoury will be presenting the work of his MASc thesis and also as part of the Material Seminar Series. 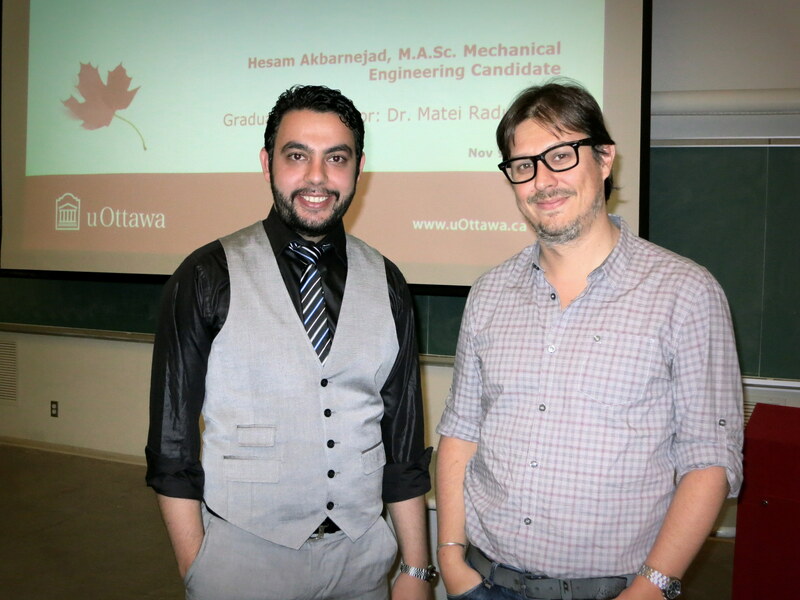 The title of Pascal’s talk is “Automated Optimization of Composite Material and Part Design”. The abstract of his talk is below. All are invited to attend. TIME: 3:00pm (note this is in keeping with the starting time for Material Seminars). Fibre reinforced composites are well suited for applications such as transportation and sporting goods, where light weight and high structural properties are required. These materials can offer superior specific strength and stiffness as well as better corrosion resistance than traditional metal alloys. Furthermore, they provide longer fatigue lives, tailorable properties and the ability to form to complex shapes. Given that these materials are orthotropic, the problem of selecting fibre alignments to maximize a part’s stiffness and strength is not trivial. To this end, software was developed that aims at facilitating the design of fibre-reinforced parts. This software combines a finite element analysis solver and a library of nonlinear optimization routines to minimize the deflection of a given part subjected to a given load. The finite element solver which was developed first discretizes the selected part geometry through the use of the ‘tetgen’ tetrahedral mesh generator. This library generates exact constrained Delaunay tetrahedralizations given a set of boundary facets. These facets can be inputted through STL or PLY files, which can, in turn, be created with common solid modeling programs such as Solidworks. Reduced generalized node tetrahedral elements were employed for modelling the response of each tetrahedral element to rotations and displacements at its nodes. An orthotropic material property stiffness matrix was formulated, along with a transformation matrix to account for the off-axis orientations of the fibres within each element. Specifically, each element’s properties were calculated as functions of the fibre volume fraction and alignment assigned to the element. The elements’ stiffness matrices were assembled to model the response of the entire part to the loading at its nodes. The Eigen linear algebra library was used for solving this assembled stiffness matrix. Fibre volume fractions and orientations were initialized to an arbitrary starting value, and then dictated by a nonlinear optimization routine provided by the NLopt library. The optimization algorithm then used the displacement values and gradients calculated with the finite element analysis solver developed to hone in on orientations and volume fractions for each tetrahedral element, optimizing the stiffness of the given part. Test parts consisting of a basic bar geometry, as well as more complex geometries were inputted to ascertain the performance and accuracy of the program. Given sufficient time and computing power, this method could be used for optimizing more complex parts. With the addition of accurate failure criteria and density calculations, complex structures could automatically be generated which maximize specific strength instead. Erik Tolonen will be presenting his thesis seminar on Friday 23rd November at 2:30pm in SITE B0138. All are invited to attend. 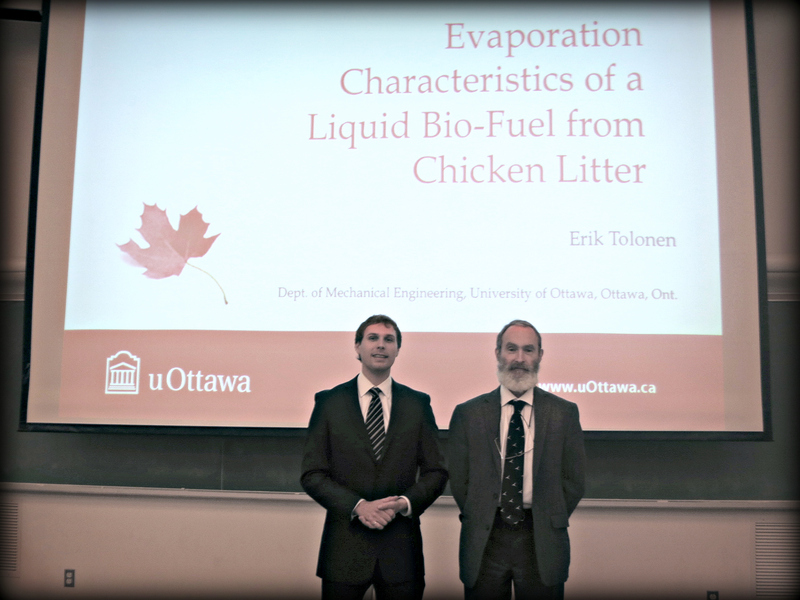 The title of Erik’s talk is “Evaporation Characteristics of a Liquid Bio-Fuel Derived From Chicken Litter”. The talk abstract follows below. Liquid bio-fuels can be produced from various types of waste biomass by the process of fast pyrolysis, and upgraded using the techniques of microwave solvent extraction and column chromatography. The evaporation characteristics of this fuel as single droplets were studied, and a numerical model developed to describe this process. Raw chicken litter, consisting mostly of manure with small amounts of beading straw was introduced into a stirred bed reactor containing stainless steel shot. The bed was maintained at 375 oC and the resulting vapors were condensed. The recovered liquid was separated through microwave solvent extraction and column chromatography; neutral compounds consisting predominately of hydrocarbons and related species were collected. Analysis of the compounds in the fuel by pyrolysis field ionization mass spectrometry (Py-FIMS) showed the presence of hydrocarbons, alcohols, fatty acids and alkyl-benzenes along with small quantities of other types of compounds. Droplet evaporation tests were performed using the suspended droplet/moving furnace technique. A nitrogen atmosphere was used to suppress combustion and achieve pure evaporation. The evaporation of the droplet was modeled with a continuous thermodynamics droplet model used with considerable success for other complex biofuels. This required representing each significant chemical family in the fuel by a probability density function and devising suitable correlations for the thermal properties of each group. The droplet evaporation model showed good agreement with the measured droplet evaporation rate and temperature; deviations observed were mostly caused by internal boiling of the droplet which the evaporation model does not take into account. The initial heating phase and evaporation which occurs after internal boiling ceases is in good agreement with the model. 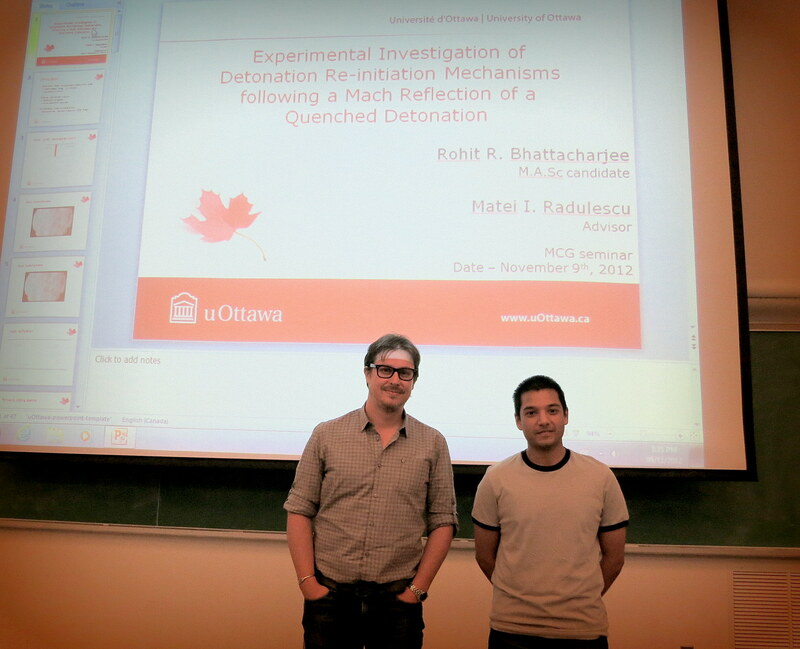 Hesam Akbarnejad and Rohit Bhattacharjee presented their thesis seminars last Friday. A copy of Rohit’s seminar can be found here. Some pictures of our soon-to-be graduating students with their supervisors. Click on the pictures for a larger version. Hesam Akbarnejad with supervisor Dr. Matei Radulescu. 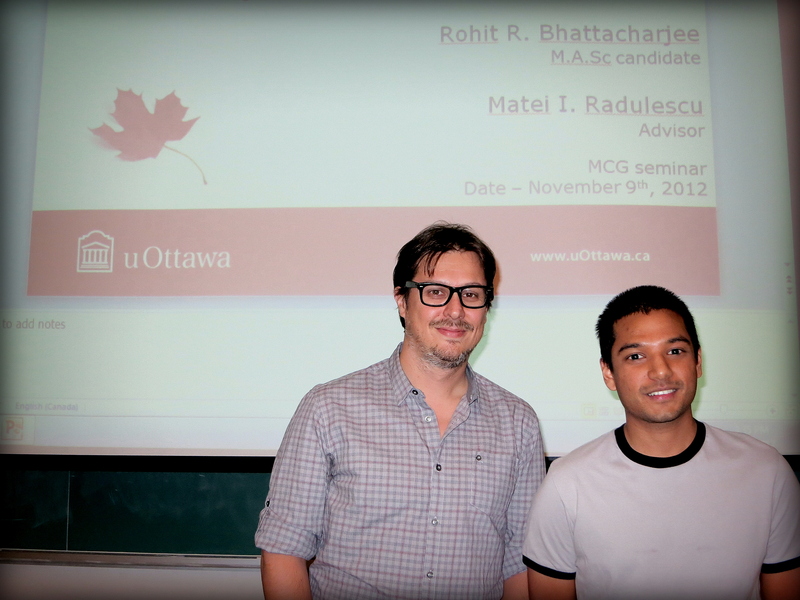 Rohit Bhattacharjee with supervisor Dr. Matei Radulescu. Detonation waves are supersonic combustion waves that have a multi-shock front structure followed by a spatially non-uniform reaction zone. During propagation, a decoupled shock-flame complex periodically re-initiates into an overdriven detonation following a transient Mach reflection process. While past researchers have identified mechanisms that can increase combustion rates following a Mach reflection, due to the small length scales and stochastic behaviour of propagating detonation waves, the important mechanisms that can cause detonation re-initiation have yet to be elucidated. If a detonation wave diffracts behind an obstacle, it can quench to form a decoupled shock-flame complex and if allowed to form a Mach reflection, detonation re-initiation can occur. This technique permits the study of re-initiation mechanisms reproducibly with larger spatial scales. Therefore, the objective of this study is to experimentally investigate and clarify the key mechanisms that can increase chemical reaction rates and sequentially lead to re-initiation of a decoupled shock-flame complex, behind a cylindrical obstacle, into an overdriven detonation wave following a Mach reflection. All experiments were carried out in a thin rectangular channel using a stoichiometric mixture of methane-oxygen. One of the obstacles used was a half-cylinder obstacle. Schlieren visualization was achieved by using a Z-configuration setup, high speed camera and high intensity light source. Results indicate that forward jetting of the slipline behind the Mach stem can potentially increase combustion rates by entraining hot burned gas with unburned gas. Following ignition and jet entrainment, a detonation wave first appears along the Mach stem. The transverse wave can form a detonation wave due to rapid combustion of unburned gas which may be attributed to – a) shock interaction with the unburned gas; b) turbulent mixing by the Kelvin-Helmholtz instability. The topic of SHS process (Self-propagating High-temperature Synthesis) in bi-metallic reactive systems has been the focus of much attention over the past two decades. The effect of initial porosity in such systems is shown to influence the reaction behavior; however, this phenomena has, as of yet, not been accurately modeled. This thesis documents and studies the effect of porosity on the flame speed in Bimetallic Reactive Systems. The analytical approach is based on the Makino’s model which predicts the heterogeneous behavior of SHS process using Spray-Combustion method. An attempt has been made to modify this model as a function of material porosity by relating the flame speed to the thermal conductivity of the mixture. To do so, thermal conductivity of porous materials is modeled and experimentally measured as a function of the density ratio. To precisely model the thermal conductivity, the micro-structure of the mixture is also studied. Consequently, bimetallic reactive systems are categorized into the low and high porosity materials and for each case, a specific model has been suggested. Finally, using empirical adjustments, an equation relating the flame speed to the density ratio of the mixture is obtained. Comparisons of the model with the experimental results are satisfactory. Using these results, it can be concluded that the flame speed in SHS processes is related to the initial porosity of the mixture mainly by its thermal conductivity.